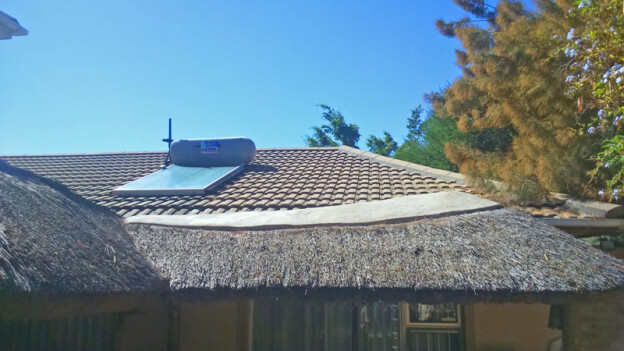 This thermosiphon solar geyser system which we installed almost 5 years ago in Kuils River has been serviced recently & is in tip-top condition again. We are indeed blessed with happy customers who are reassured that they have a high quality installation and system. Our installations meet the SABS standards (including all the safety measures as relevant for the Western Cape climate). This geyser (which don’t rust) and flat panel in this picture are designed for our weather and locally produced. During this service at Kuils River, we drained and flushed the solar panel to remove a lot of impurities accumulated from the municipal water pipeline. By removing the debris accumulated in the solar panel, we ensured that thermosiphon flow will take place at optimum rate, which results in a higher geyser water temperature through the workings of the sun. Service your solar geyser system ….yes or no? The benefits outweigh the cost and time. If you are unsure and have questions, you are most welcome to contact us. We also provide the client with the following information about the possible savings over the past 5 years. Your annual environmental savings (conservative calculations) from switching your electrical geyser to solar: The following savings is calculated from using less coal (coal being burned to generate electricity). We provide the relevant information (for 150 or 200 liter system), e.g. As the electrical geyser contributes between 39% to 60% towards your electricity bill: your saving may be between R390 to R600 per month per R1000 electricity bill. At an average of 45%, one can calculate it at R450 per month (per R1000 electricity bill) and the result may be a saving of R450 x 12 months x 5 years = R27,000. This is just an example and it would be interesting to hear if you have done any calculations. What if we did not install your solar geyser system, but you can’t find the original installer? Maybe you are not sure whether your system benefits from the sun and is only working with the electricity backup? Are heat traps installed on a pump system? Does the pump solar system have a 180° heat release valve on the roof? Does your solar system have a tempering valve to saveguard you against burning (solar water can reach temperatures which can burn/injure the user)? Pump system: Is there an intelligent controller to run the pump or is it just running on a PV panel and battery? If the geyser is located inside the roof, are the drip tray and all outlets installed correctly? Is a timer installed and set correctly? Was an isolator installed in the roof? Does the system have a stopcock to switch off the water supply in case of an emergency? If the system is correctly installed, we can service your system while we are on-site. If the system is incorrectly installed, we’ll provide you with a quote to make the corrections. If you require any of our other services, we can discuss your requirements when we are at your property.